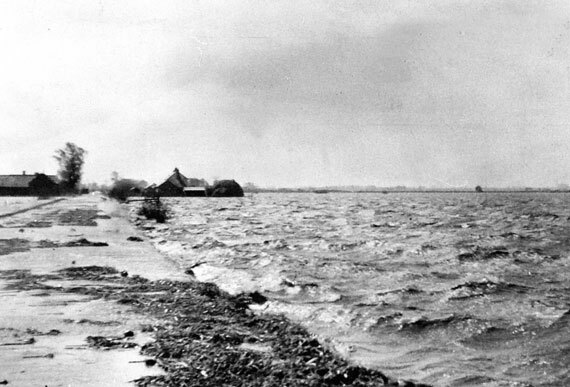 In 1947 a catastrophic combination of high tides, meltwater and a wind surge caused a breach in the flood defences north of Crowland which inundated 20 square miles of farmland which reached the northern boundaries of the village. Winter of 1947 was a cold one, Woburn in Bedfordshire registered a low of -21 °C on the 25 February. March was even worse. In the first half of the month, there were strong gales and heavy snowstorms, making for blizzard conditions. On 4 and 5 March, heavy snow fell over most of England and Wales, with severe snow drifts forming. On 6 March, drifts were five metres deep in the Pennines and three metres deep in the Chilterns. As the cold weather ended the temperatures rapidly got up to about 10 °C, and the leftover snow began to thaw rapidly. This created a serious problem. The ground was still frozen solid due to the weeks of cold weather, leaving the melting snow with nowhere except into the streams and rivers. The ‘hurricane’ of Sunday the 16 March also compounded the problem, winds over southern England averaged about 60mph, with gusts of up to 100mph. This caused damage to buildings and caused even more problems as the strong winds created waves which pounded flood defences. An upper portion of one of the pinnacles on Peterborough Cathedral was blown off, about 5ft long it crashed into the graveyard. By Wednesday 19 March it was recorded that the River Nene at the town bridge in Peterborough was running at 17ft 9ins (5.4m), more than 8ft (2.4m) above the normal level. Men were already working to protect the barrier bank at Welland when the breach occurred on Friday 21 March 1947. 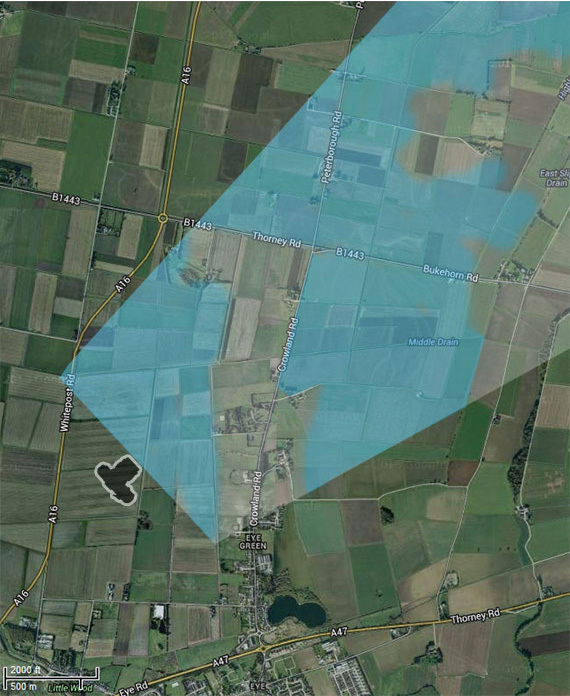 Water poured quickly through the breach onto the surrounding Fenland until Crowland itself was completely surrounded in water becoming a virtual island. The water eventually reached as far as English Drove, north of Thorney, and as far south as the railway line at Eye. 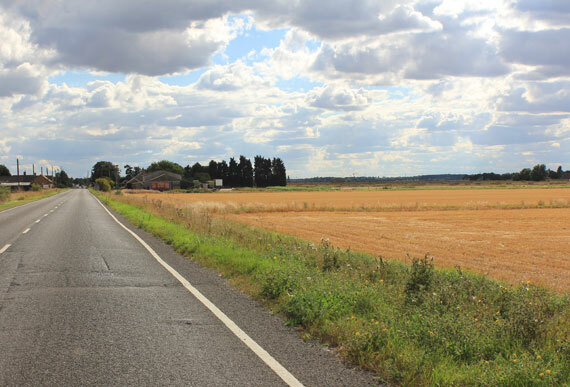 The only route in or out of Crowland was via the B1040 towards Thorney. The Sea Cadets were called in to provide support to the police and military. This included ferrying food to cut off families and rescue others. Their ‘fleet’ consisted of a jolly boat and two dories. 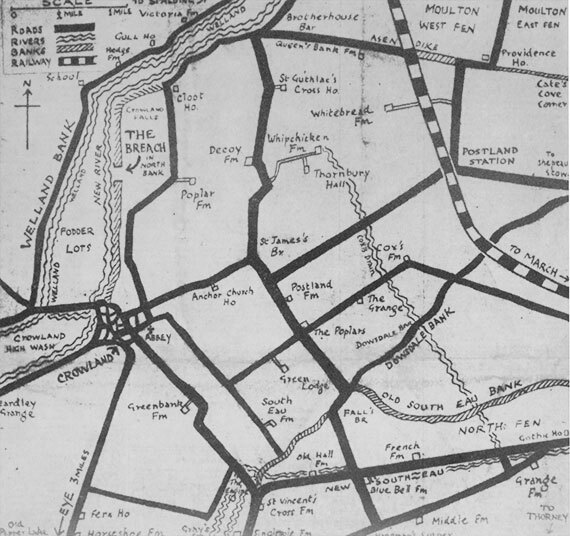 Due the difficult access to the site a three quarter mile stretch of light railway was laid from Crowland to the breach so stone could be transported to build an encircling wall. The stone to fill the breach came from quarries at Helpston and Yarwell so it had to take a longer route via Thorney. 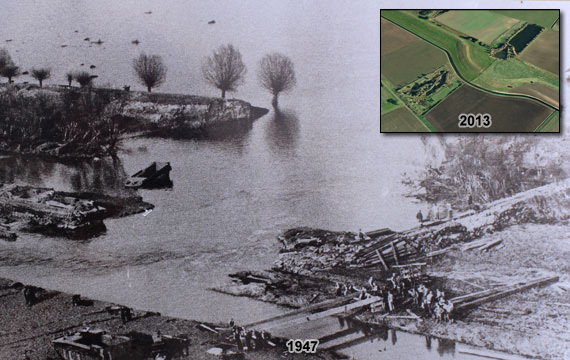 Villagers, R.E cadets and German Prisoners worked to build stone causeways either side of the breach. Brigadier G Younghusband, Deputy Commander of the North Midlands District decided to bring amphibious tanks to speed the sealing-off operation. The first of 16 Amphibious “Water Buffalo” tanks (or LVT’s (Landing Vehicle Tracked)) arrived. The plan was to reduce or stop the flow of water so repairs could progress faster. The tanks were placed at the extremes of the stone causeways. An engineer at the time explained that “tanks could not be placed directly in the breach as the tremendous pressure of the water had eroded a hole 28 feet below ground level” the height of two double-decker buses. Over 18,000 LVT’s where produced during World War II. The breach is finally sealed. The Mayor of Peterborough’s flooded Houses fund had raised £418 (approx £13,500 in today’s money) to be distributed to those most in need. Work continued to strengthen the rampart. Equipment was put in place along the north bank to pump water from the fenland back into the wash. Eight heavy pumps and nine extra heavy pumps from the Home Office Depot at Warboys were pumping 50,000 gallons a day back into the wash. Such was the flooding the Minister of Agriculture at the time, Mr Tom Williams paid an informal visit. He promised full co-operation of his department and said his department would look sympathetically at an application for 90% grant to make permanent repairs to the breach. The Minister was escorted from Thorney to Newborough, along the bank to Crowland before he headed off to Tydd. A second breach occurred at 7 am when the water swept away five of the LVT’s. The Peterborough Citizen and Advertiser reported the tanks whirled away like matchsticks. Three of the tanks were sucked down into the 28-foot hole created by the original breach. 12 further tanks were brought in from York to repair the damaged rampart. The image above is looking north-east taken on Wednesday 16 April 1947. The area in red shows the most seriously flooded areas. Click on the image above to magnify an area of the photo. (4400Kb). The plan view below shows the approximate area that is in view. The image above was taken on the afternoon of Sunday 13 April 1947 after a second breach occurred. The photo (1947) above looks like the photographer was standing on a causeway in the middle of a large lake but the view is actually looking south along Crowland Road, just to the north of Masons Bridge. The road was previously underwater (Credit: John Kemmery). Image from 2013 below. The New River was diverted and the breach was sealed for the second time. The last of the twelve Buffalo tanks where put into position between steel interlocked piles. With tarpaulins, wire mesh and sandbags, the construction was finally waterproofed. The permanent sealing cost was around £100,000, around £3 million in today’s money, and was undertaken by the Dredging and Construction Co, King’s Lynn, now Visser & Smit Hanab. Over 200 men were employed in the task. It is due to the determination of local farmers that after the breach had been repaired a harvest was brought in later that year from farmland that had been underwater. One enterprising farmer used a Miles Aerovan to sow seeds from the air. After the floods subsided, new works such as the Coronation Channel which opened in 1953 were constructed to control flooding in Spalding and the surrounding area. In the end, 1947 was quite a dramatic year weather-wise, Woburn in Bedfordshire registered a low of -21 ° C, the coldest February since records began in 1659 and taking England and Wales as a whole, March 1947 was the wettest on record with 177.5mm recorded on the England and Wales precipitation series. The summer of 1947 was the 6th warmest on record in record and October the 6th driest since records began in 1766. It was also a year of exceptionally high sunspot activity which may have contributed to the weather that year. Here is a modern day flood map from the Environmental Agency that shows the flood risk. 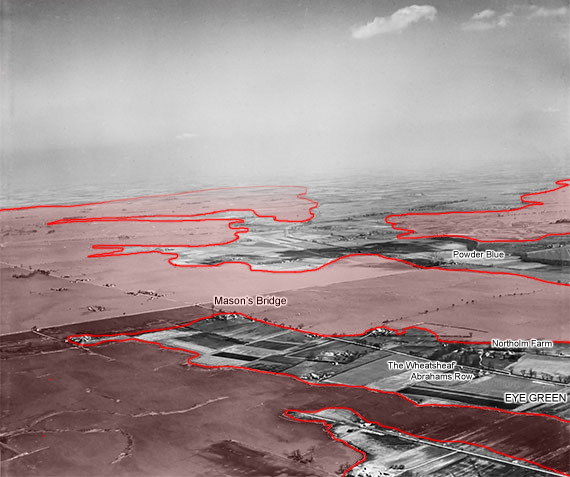 The area to the north of the A47 very much shows the areas that suffered in the 1947 flood. For further information the Jackdaws of Crowland has a wide range of photos. Where abouts are the Buffalo’s now ?? © Eyepeterborough.co.uk | Sponsored by Your company here.